There’s a second story in this book as well, “Dragon’s Claw”, but we’ll be returning to the Marvel run next week starting with that issue, so I’ll review that story then. That’s the problem with IDW’s format. It’s more like a collection of strips rather than Marvel’s formatting it to look like an actual comic book. 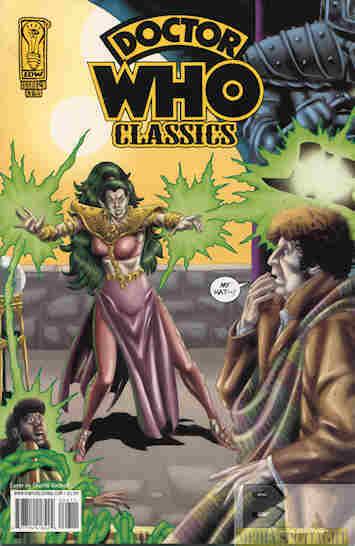 As for the other story, Brimo learns of the Doctor’s arrival as the half of the TARDIS he was on is now blocking the gateway between dimensions, causing her to use material she’s already created to create and do battle with the Doctor. In the end he tricks her into defeating herself but the breach in space/time is now four years apart, so when the Doctor rejoins both halves of the TARDIS he and Sharon age four years, making her physically an adult now. What they got right: The Doctor is properly presented here, like his “shock” over a name he’s never heard before and how he outsmarts Brimo. What they got wrong: So is the Doctor closing the rift? Because if not she could reach through again. And why couldn’t she convert the Eternity Capsule she created into something to get her out? It’s what happened before, isn’t it? And why did they feel the need to physically age Sharon? She’s still a teenage girl in mind. That’s what happened to Lion-O. Recommendation: As stated earlier I’ll be reviewing “Dragon’s Claw” when we return to the Marvel run, which in this case is the better reprinting to feel like you’re reading a normal comic book. This isn’t a bad substitute mind you, just Marvel’s presentation is better. Posted by ShadowWing Tronix on October 3, 2018 in Television Spotlight, Yesterday's Comics and tagged K-9, Sharon Davies, The Fourth Doctor.